The Land of the Dead: 'The other shore'. The idea of a 'land of the dead' is a concept which appears in myths and traditions from various cultures around the ancient world. Without a modern equivalent, mainstream religions today are unable to offer anything with which to compare, the basic difference being that the land of the dead was then believed to be a physical place; a land that mortals could travel to and from, visit and talk to the dead, even (almost) bringing them back in the case of Orpheus and his wife. It has been said that we have learnt more from archaeology about the rituals of death than we have of the living, but it is only recently that we have been able to build a more accurate picture of the practices involved. Archaeological evidence supports the idea that our relationship with the dead has changed considerably over time with patterns emerging which suggest a transition from an early belief system in which we likely inhabited the same landscape as the dead, living alongside them and sharing our thoughts and daily routines with them, to one in which death becomes the final act of the living, following which we are separated by the definitive 'Valley of Death'. The transition from Mesolithic to Neolithic appears to mark an elaboration of these rituals, perhaps not unexpectedly as it was also the start of a period of sustained human growth and cultural development around the ancient world. The separation between the lands of the living and the dead was both a physical and imaginative process, with the last few thousand years producing a variety of belief systems, most of which have left behind such intimate relationships with the spirit world effectively severing the connection between the living and the dead. The land of the dead is mentioned in several important texts, not least of all, the earliest known written story in human history; The Sumerian 'Epic of Gilgamesh'. Other important literary works such as the Egyptian 'Book of Thoth', and several Greek texts, most famously 'The Odyssey' also describe journeys by mortals to the realm of the dead. With the exception of the Egyptian concept, the location of the land of the dead was considered to be a physical, accessible place at the same time as being located almost beyond the boundaries of the known, visible world, often existing either underground or far out at sea, but one that could always be found by those who sought hard enough. Scholars have suggested influences from Near Eastern mythology and literature in the Odyssey. In particular, the substantial parallels between the Epic of Gilgamesh and the Odyssey. Both Odysseus and Gilgamesh are known for travelling to the ends of the earth, and on their journeys go to the land of the dead. On his voyage to the underworld, Odysseus follows instructions given to him by Circe, a goddess who is the daughter of the sun-god Helios. Her island, Aeaea, is located at the edges of the world, and seems to have close associations with the sun. Like Odysseus, Gilgamesh gets directions on how to reach the land of the dead from a divine helper: in this case, the goddess Siduri, who, like Circe, dwells by the sea at the ends of the earth. Her home is also associated with the sun: Gilgamesh reaches Siduri's house by passing through a tunnel underneath Mt. Mashu, the high mountain from which the sun comes into the sky. It is therefore argued that the similarity of Odysseus' and Gilgamesh's journeys to the edges of the earth are the result of the influence of the Gilgamesh epic upon the Odyssey. While we know that burial rituals have been practiced by humans for over 300,000 years, early examples are few and far between, and it was only around 50,000 years ago during the transition from the middle to the Upper Palaeolithic that we see an increase of evidence of burials with grave goods, tools and the appearance of anthropomorphic images and cave paintings, suggesting that humans in the Upper Palaeolithic had begun to believe in supernatural beings and the afterlife. (6) While we know that burials did take place during the late middle Palaeolithic period, numbers are limited to around 200 skeletons in all Europe. This lack of burials or lack of apparent concern as to the disposal of the remains does seem to suggest that there was little or no thought as to any after life, however, even in the upper Palaeolithic, c 30,000 BP, with 50% of burials showing signs of red-ochre being sprinkled on the dead, it is recognised that this serves no function either to the dead or the living, echoing a ritualisation of the cycle of life/death, and the worship of a living earth-mother. Discoveries in Syria recently seem to support this idea of transition, where a Neolithic landscape of stone-circles and alignments has been dubbed the Syrian 'Stonehenge'. "There is nothing that seems to exhibit evidence of occupation - no houses or occupation at all. This is unusual for the Neolithic in that typically people lived where they buried their dead and worshipped... ...As such it may reflect the development of the concept of a 'land of the dead' distinct from a 'land of the living' which has been hypothesised for Neolithic ritual sites in Europe". (4) Two recent archaeological discoveries in Britain also seem to reflect this change in particular, perhaps showing the very time of transition from living alongside the dead, to when the rituals of both life and death became more elaborate, resulting in the creation of specific landscapes which for sake of a better term can be seen as having functioned as physical portals to the spirit world. These 'civil' places of sending were clearly important to the Neolithic peoples, who invested great amounts of time and energy into building several vast 'funerary' or 'ritual' complexes around the western coast of Europe and the Mediterranean. Artists Impression of The Ness of Brodgar, Orkney Islands, Scotland. For a farming community of a few thousand people to create such edifices suggests that the Ness of Brodgar was of profound importance. Archaeologists have found that many of the stone mace heads (hard, polished, holed stones) that litter the site had been broken in two in exactly the same place. "We have found evidence of this at other sites," says Richards. "It may be that relatives broke them in two at a funeral, leaving one part with the dead and one with family as a memorial to the dead. This was a place concerned with death and the deceased, I believe." This unique combination of natural and manmade Orcadian landscape was utilised for over a thousand years before being abandoned c. 2,100 BC, a fact which suggests that regardless of its obscurity (or perhaps because of it), the significance of this specific location was known far beyond the Orkney islands. In southern England a similar landscape is being realised in Wiltshire, home to Stonehenge, Silbury hill and Avebury, to name but a few sites in the area. Recent archaeology on both the Stonehenge monument and nearby Durrington Walls has led to the suggestion that the two are complimentary structures, both being part of a single 'ritual' process. Mike Parker Pearson believes that the immediate landscape around the henge and timber circle at Durrington Walls represented life and a land of the living, whilst Stonehenge and the down around it, encircled by burial mounds, represented a land of the dead. The two were connected by the River Avon and their respective avenues with a ceremonial procession route from one to the other represented the transition from life to death. Work in the region both at Stonehenge and Avebury started at around 3,100 BC, the same time as the Orcadian structures began. The Radiocarbon dates of approximately 2,600 BC from Durrington are roughly contemporary with the earliest stone phase at Stonehenge and fall in the middle of the Orkneys period. 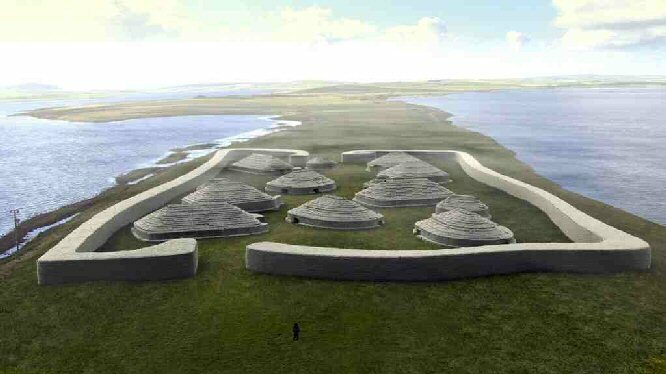 Perhaps not so coincidentally, several of the house plans at Durrington walls have been noted to be strongly reminiscent of constructions at Skara Brae and 'Grooved ware' pottery found is identical to that from the Orcadian houses of the 3rd millennium BC. Perhaps more interesting are the suggestions that the dead/dying were brought to this very spot each year from across prehistoric Europe, at a time Aubrey burl calls the 'Dark age of Prehistory' because of the lack of funerary remains at that period of time. Egyptian Land of the Dead: 'The book of Thoth'. The symbolic separation between the land of the dead and the living can be seen between the ancient architecture on the eastern and western sides of the Nile, in fact, the Nile itself can be seen as a representation of the river one crossed after death to get to the 'Land of the Two Fields'. In essence, the ancient Egyptians saw the east bank as "the land of the living" since that's where the sun rose every morning. They built their temples and homes on that side, and they thought of the west bank as "the land of the dead" since that's where the sun sets. Many of the tombs and funerary temples lay there. There was once a father and son, both of regal lineage, who sat watching two funerals from the palace at Thebes. The son, a renowned child magician, watched both funerals carefully as the father, who was a Prince in the palace, was in awe only of the rich man’s funeral. The rich man’s casket was shrouded in the finest Egyptian gold and was attended by a plentitude of servants, neighbours, maidens, admirers and priests, all of whom bore gifts and chanted prayers and pleasantries for the man to the gods. Their prayers were for the man’s safe passage to the city of the dead. The poor man’s funeral, on the other hand, was not quite as elaborate. It was rather simple and only attended by those who truly loved him – his sons, daughters-in-law, and his wife. As it was, the father eventually made a comment. “When I die, I want my funeral to be like that of the rich man!” he said. “I hope your funeral is like that of the poor man,” the son replied. To this statement, the father was crushed. He could not believe that his own son would want a poor man’s funeral for him. Seeing his father’s anger, the boy tried to explain what he meant to his father and took him to the temple of Osiris: When Setna had barred the doors, Se-Osiris drew a magic circle round them and round the statue of Osiris and round the altar on which a small fire of cedar wood was burning. Then he threw a certain powder into the flame upon the altar. Thrice he threw the powder, and as he threw it a ball of fire rose from the altar and floated away. Then he spoke a spell and ended with a great name of power, a word at which the whole temple rocked and the flame on the altar leapt high, and then sank into darkness for standing on either side of the altar he saw himself and his son Se-Osiris only suddenly he knew that it was not his own body and the boy's for the two bodies lay in the shadows cast by these two forms - the forms of their Ka's or doubles, and above each Ka hovered a tongue of flame which was its Khou or spirit - and the clear, light of the Khou served to show its Ka and the dim form of the body from which Ka and Khou were drawn. ...All these things and more the Ba of Se-Osiris showed to the Ba of his father Setna; and at length he said, 'Now you know why I wished your fate to be that of the poor man and not of the rich man. For the rich man was he in whose eye the pivot of the Third Door was turning - but the poor man dwells for ever in the Fields of Peace, clad in fine robes and owning all the offerings which accompanied the evil rich man to his tomb.' Then the two Ba spread their golden wings and flew back through the night to Thebes. There they re-entered their bodies which their Kas had been guarding in the Temple of Osiris, and were able to return to their place as ordinary, living father and child, in time to see the sun rise beyond the eastern desert and turn the cliffs of Western Thebes to pink and purple and gold as a new day dawned over Egypt. Gilgamesh and the Land of the dead: Earliest copy: Sumerian c. 2100 BC. Gilgamesh complains to Enkidu that various of his possessions (the tablet is unclear exactly what — different translations include a drum and a ball - shamnic items?) have fallen into the underworld. Enkidu offers to bring them back. Delighted, Gilgamesh tells Enkidu what he must and must not do in the underworld if he is to return. Enkidu does everything which he was told not to do. The underworld keeps him. Gilgamesh prays to the gods to give him back his friend. Enlil and Suen don’t reply but Ea and Shamash decide to help. Shamash makes a crack in the earth, and Enkidu's ghost jumps out of it. Out of this the ghost of Enkidu rose "like a wind," and the two friends embraced again. Gilgamesh at once began eagerly to question the ghost about the condition of the dead, but Enkidu was loath to answer, for he knew that what he must reveal would only cause his friend dejection. But the last lines of the Tablet tell the lot of those who have died in various circumstances; though some who have been duly buried are in better case, the fate of others who have none to pay them honour is miserable, for they are reduced to feeding upon dregs and scraps of food thrown into the street. Odysseus and the Land of the Dead: Written c. 1,200 BC (1). Odysseus and his men go down to Hades to talk to the spirit of Tiresias, on recommendation of Circe. Odysseus goes to the River of Ocean and makes sacrifices as Circe told him to do, so as to attract the attention of the souls. The first soul to appear to him is the soul of the crew member who they had lost on the island of Aeaea, whom pleads Odysseus to go back and give him a proper burial. The next soul that appears to him is Tiresias, the blind prophet. He tells Odysseus that Poseidon is punishing the Achaens for blinding his son Polyphemus. He tells Odysseus' fate, that he will return home reclaim his palace and wife from the contemptible suitors who have taken over his home. He warns Odysseus not to touch the cattle on the island of the sun god. Odysseus also speaks with his mother. She updates him on what is happening in Ithaca and tells him she died from grief of waiting for him to return. He then leaves the land of the dead, heading back to Aeaea to bury his fallen man. Hercules: To fulfill one of his twelve labors, Hercules had oo go into the underworld and return with Cerberus, the dog of Hades. With the help of Hermes and Athena, he forced his way across the river by beating Charon. He then fought Hades, and after being victorious took the dog. While there, he came across Theseus and released him. Theseus: Theseus went to the underworld to return a favuor to Pirithous who helped him kidnap Helen. Pirithous wanted to marry Persephone but he would but would have to overcome Hades in order to accomplish this. Theseus and Pirithous fought their way to Hades’s palace. Pirithous told Hades he wanted to marry Persephone but Hades was not about to let her go. He asked the two to sit down. They sat down on chairs of oblivion where they were trapped for years. Theseus was later released by Hercules, but Pirithous had to remain. Orpheus: Orpheus was an excellent musician who lost his wife to a snakebite. He used his music to gain entrance into the underworld. Persephone had pity on him and told him he could return with his wife to the land of the living. One requirement was that he could not look back until he was out of the underworld. He resisted the temptation to look back until they were almost out of the underworld. He tried to sneak a look back at his wife. As soon as he did, his wife returned to the underworld. He was not able to return again until his natural death. Aeneas (Roman Myth): Aeneas was a Trojan Hero in Greek and Roman mythology. After Troy fell he and other survivors of the Trojan War fled and sailed away to find a new home. After landing in Italy, Aeneas tried to determine where to settle. Aeneas visited Cumaean Sibyl, a prophetess who had access to the underworld through a cave with a hundred openings. Sibyl agreed to be Aeneas’s guide and directed him to take an item from a nearby magical bough, which was sacred to Proserpine (Persephone), wife of Pluto (Hades). Charon, the ferryman of the underworld, allowed Aeneas to pass because of the item from the magical bough. In the underworld, Aeneas spoke to his father Achises. He told Aeneas where to settle. Aeneas returned from the underworld and sailed on to the Tiber River in a land called Latium. He married a princes and founded the city of Lavinium. Sisphus: Sisphus was a very clever man, who deceived the gods and was famous for outwitting the god Thanatos (death). First he offended Zeus who sent Thanatos after him. Sisphus tricked Thanatos and held him captive so that no mortals were able to die. Zeus sent Hermes to release death, who then caught up with Sisphus. In order to cheat death again, Sisphus told his wife not to give him proper burial rights. When entering the underworld he was not able to pay the crossing fee to Charon. He begged Persephone to allow him to return to earth for three days and punish his wife for not properly preparing his body for death Persephone agreed. After three days, Sisphus did not return to the underworld. He lived out the rest of his natural life to an old age. Sisphus, like any mortal, died of old age, and when he entered the underworld he was sentenced to Tartarus to be punished for his crimes. The Land of the Living. Death is one of the great mysteries in life, one which we all share and one that none can avoid. It binds us together and humbles us in our last moments. It is difficult to imagine what the concept of death must be like for an insect, a fish, or dog, but it should be remembered that it wasn't more than a few million years ago that we ourselves were proto-sentient creatures and nothing like the emotional, imaginative, creative beings we are today. So what exactly is the difference between us now and then.? It seems that the rituals of human burial are only a fairly recent development and while we have absolutely no idea how the dead were dealt with before this time, a clear development of funerary rituals can be seen to have occurred in the last 300,000 years. However, it is the inclusion of artefacts such as tools, wealth, food, and other 'useful' items for the afterlife that can be seen as the critical turning point in the concept of a 'Land of the Dead', and one which seems to appear around the ancient world. The Neolithic, as we have seen, marks a turning point in the way the dead were sent off with large civil ceremonial landscapes and structures being built through which it is suggested the dead were prepared for the afterlife. Perhaps we no longer had any use for our ancestors, or we simply had more important things to do, but written evidence from the Middle-east and Greeks support the idea that following the Neolithic, a common set of beliefs still existed which referred physical land of the dead. It is also noticeable that there has been no further reference to such a place since then, reflecting our shifting ideas concerning the relationship between the living and the dead. It is of course true that there are still indigenous cultures today such as the aboriginal Australians or the Native American Indians, and many other smaller, isolated tribes around the world which still share their lives with their ancestors. The Australian aboriginals in particular have a number of extant beliefs concerning the land of the dead, many of which essentially weave the living landscape with that of the dead, leading to a belief that the spirits inhabit places familiar to them, and alongside the living. (1) But there seems to be no room for the dead in the hustle and bustle of modern 'civilisation' who are despatched to the afterlife quickly and clinically, and for whatever the reason; perhaps because it cant be controlled or perhaps because we are simply afraid of it... the dead have been effectively banished from modern life, and for as long as that remains the case the land of the dead remains closed to the living and with it the wisdom of all the ages.